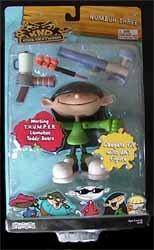 Numbuh Three comes with a fully working T.H.U.M.P.E.R. (Teddy Hurling Ultra Microwave Powered Ejection Rifle) gun, which fires not-so-cuddly teddy bears. 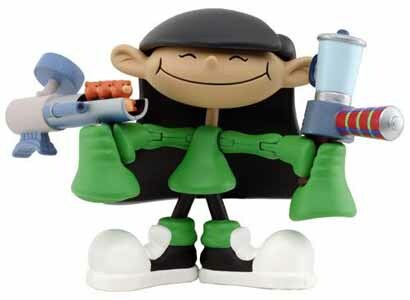 She also has a scaled down version of the F.R.A.P.P.E. (Fires Rings and Paralyzes Potential Enemies). A full-size version of the F.R.A.P.P.E. that fires foam discs is also available.